The first mention of the pub is in 1795 when it is referred to in passing in a legal document. 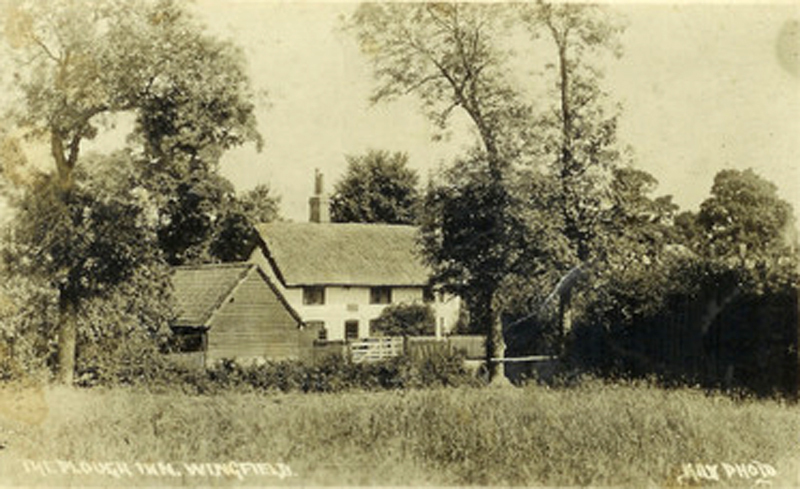 In 1821 James Whinnett of Wingfield, yeoman, devised to his eldest son James a building previously called the Three Horse Shoes, then the Queen’s Head in Tebworth. He died in 1824. His son James made his will in 1837 leaving the pub to trustees until his “natural daughter” Flora was twenty one. He died in 1838 and Flora married Alfred Hack, by whom she eventually had ten children. 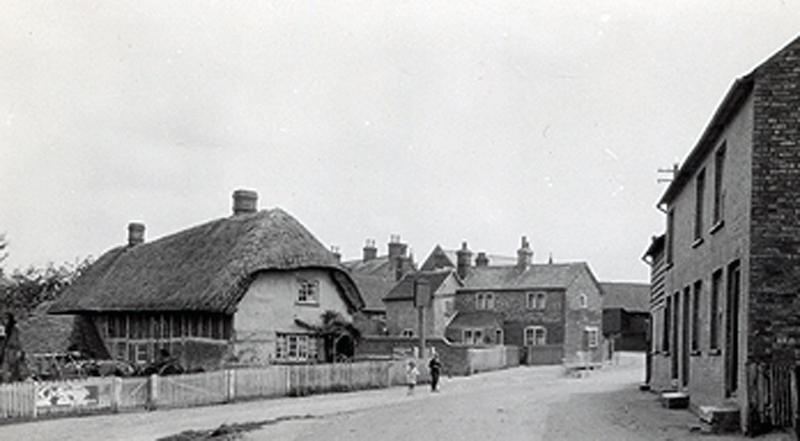 Hack mortgaged the pub in 1863 to Thomas Linnell and Woburn solicitor John Thomas Green and when he defaulted they were quick to sell the property in 1867 to William Maddocks but he was a speculator and sold it on, at £10 profit, to Leighton Buzzard shoemaker Joseph Reeve. He conveyed the pub to Newport Pagnell [Buckinghamshire] brewers Francis and William George Allfrey in 1890. The countywide licensing register of 1903 reveals that the property was “clean and in good repair” and had one front door, one side door and one shop door. In 1905 the Bedford brewer Charles Wells took over ownership. The Rating and Valuation Act 1925 legislated that every property and every piece of land in the country was to be assessed to determine its rateable value. The valuer visiting the Queen’s Head noted that the tenant paid £10 tied rent per quarter and that: “this house is under construction”. It would contain a public bar, a private bar, a living room, a jug and bottle department, a scullery, a pantry and a cellar with four bedrooms on the first floor. Outside stood a weather-boarded and corrugated iron coal barn, a private earth closet and a public urinal and earth closet in yard. 1½ barrels of beer, three dozen mixed bottles of beer and a smiliar amount of minerals were sold each week and between half and one gallon of spirits per month. Gross takings were £30 per month. The valuer commented: “Very nice. Rebuilt 1926. In centre of village. Modern. Easily worked place”. Today  the Queen’s Head is the last licensed premises in Tebworth. History courtesy of Bedfordshire Borough Council Community Archives. The Queens Head public house is recorded from at least 1795, though in 1821 it was described as the Three Horse Shoes or Queens Head. The original Queens Head Public House Tebworth (c1900). The new building was built in 1926. The building is 18th century. 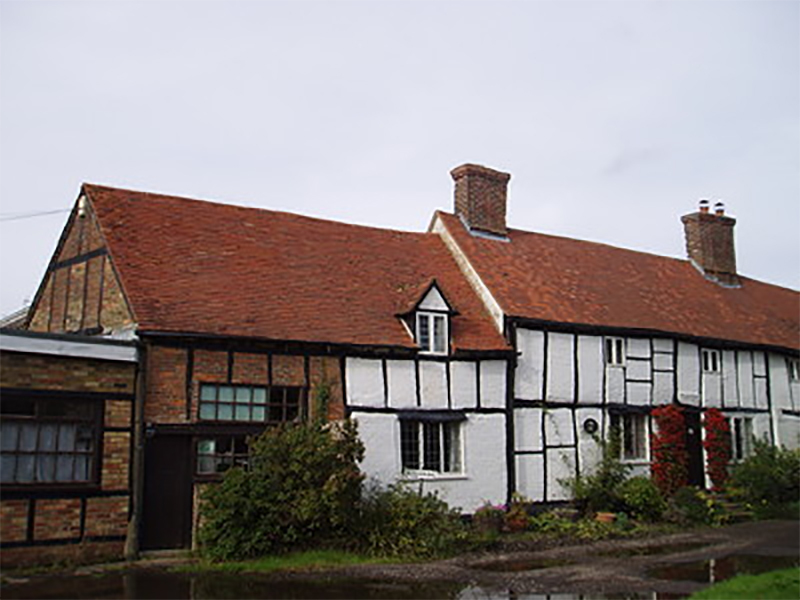 It is built of colour-washed brick and comprises two storeys beneath a thatched roof. The place might have been built as a public house or may have become one later, without deeds it is impossible to say. We know, however, that it was certainly a pub by 1822 when it was included in the countywide register of alehouse recognizances. In 1882 the Plough was in the ownership of Morris and Company, brewers of Ampthill as it was mortgaged in that year to Susanna, Mary Jane and Sophia Morris in order to raise capital. It is described as having a yard, garden, barn, buildings and premises adjoining as well as 1.5 acres of land. The countywide licensing register of 1903 noted that the pub was: “in fairly good repair, but kept untidy”. It had one back door, one front door and one side entrance to a yard. The Rating and Valuation Act 1925 stated that every piece of land and building in the country was to be assessed to determine the rateable value. The valuer visiting the Plough found that it now belonged to Luton brewer J. W. Green Limited. Green had bought out Morris & Company in 1926. The tenant, F W B Kingham, would pay £12 tied rent per quarter including an adjoining orchard of 1.352 acres (probably the 1.5 acres of land noted in 1882). The brick and thatch structure comprised a tap room, a sitting room, a kitchen, a cellar and three bedrooms. Outside stood a weather-boarded and tiled three bay open hovel, two old weather-boarded and tiled stables for two horses each, a coal barn and a weather-boarded and tiled earth closet. Trade consisted of 1.5 barrels of beer per week, two dozen pint bottles of beer per week, 2.5 dozen bottles minerals per week and one gallon spirits per month. The valuer noted: “Tenant does not keep any account but estimates about 15/0 per day on a yearly average”. His final comment was: “Isolated spot”. In 1954 J. W. Green Limited merged with Midlands brewer Flowers and though Green was the senior partner the new business took the Flowers name. Flowers was taken over by Whitbread in 1962. Whitbread divested itself of its brewing and public house business in 2001. the Plough, however, survives, the only licensed premises in Wingfield and one of only two in the parish of Chalgrave. 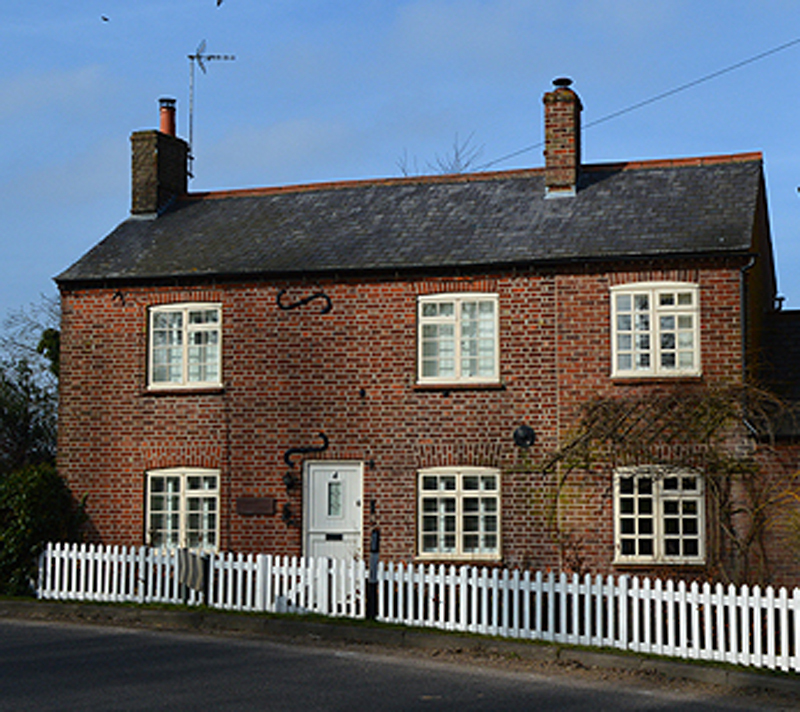 The former Shoulder of Mutton Public House building dates from the 17th century and is of timber-frame construction, whitewashed and with red brick nogging, or infill. It has a red concrete tile roof. The east wing has two storeys and the west wing a single storey with attics. The first references to the public house are in 1822 when Lower Shoulder of Mutton Close and Upper Shoulder of Mutton Close formed part of the Manor of Wingfield and when the pub was listed in the countywide licensing register. In 1841 Edward Burr mortgaged his business and licensed houses to Mary Burr and the Shoulder of Mutton was then described as “then for a long time past called or known by the name or sign of the Shoulder of Mutton”. It is described as formerly in the occupation of William Odell and Widow Norman, then Thomas Poulton, John Forster and Thomas Bates, then Ann Poulton and Thomas Tearle. These multiple occupations are reflected in the sale particular below. In 1843 Burr’s brewery and its licensed premises was put up for sale by auction in 72 lots. The sale particulars describe the Shoulder of Mutton, Lot 14, as follows: “containing Tap, Parlor [sic], lean-to Wash-house, Cellar underground and three Bed Rooms. Range of Stabling &c., Yard and Garden. A tenement under the same roof as the Public House, with Wood Hovel and Garden, and a Tenement at other end of Public House, with Stable and Garden, both let off by the Tenant. In the occupation of William Tompkins, at an Annual Rent of £9”. 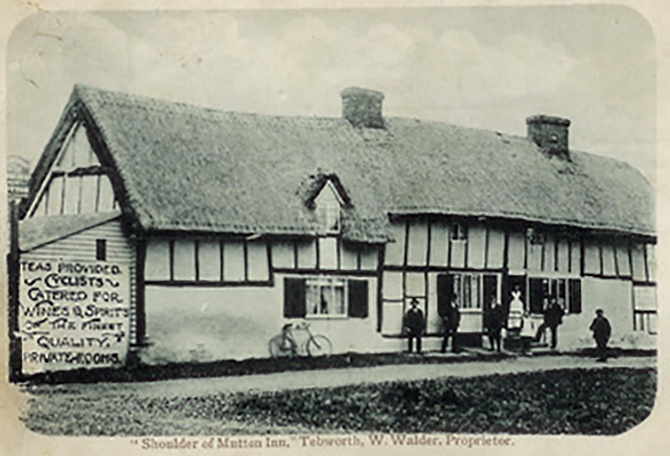 It looks as if the pub was purchased by James Whinnett as a later list of deeds refers to a “messuage at Tebworth, Chalgrave called Shoulder of Mutton with sites of two former tenements and garden ground purchased from James Whinnett and conveyed to John Morris senior on 16 October 1849”. John Morris was a partner in an Ampthill brewing firm. This firm is listed as owner in the countywide licensing register of 1876. In 1907 it was incorporated as Morris & Company (Ampthill) Limited. The countywide licensing register of 1903 noted that the pub was “clean and in good repair”. It had one front and two back doors. The pub closed for the last time in 1912 and became a private house. It was put up for sale by auction on 22nd November 1912. The particulars described the property as a double-fronted house and give a good description of the homestead adjoining: a timber and slated building on brick foundations with accommodation for six horses, fitted with mangers and racks and a brick floor; two large piggeries, timber-built and covered iron with enclosed yards; a timber and tiled cow house for three cows; a fowl-house; a large barn or cart shed; another timber and thatched barn and a well of drinking water with a pump. The Rating and Valuation Act 1925 legislated that every piece of land and property in the country was to be assessed to determine its rateable value. The valuer visiting the former Shoulder of Mutton on 29th November 1926 found it owned by Grove & Sons. The occupier was A Edwards who paid £5/10/½ per half year in rent. The property contained two reception rooms, a living room, a kitchen, a basement cellar, a coal cellar and lumber room with three bedrooms and a boxroom upstairs. A wood and corrugated iron barn and a brick and tile earth closet both stood outside. The rest of the sawmills [DV1/C23/9] had: a weather-boarded and corrugated iron saw mill 90 feet by 30 feet with a 16 horsepower compound steam engine on wheels; a woodworking lathe; a rack saw bench with a 20 inch circular saw; a band saw; a planeing machine; a weather-boarded and corrugated iron oil store; a weather-boarded and corrugated iron timber store; a weather-boarded and corrugated iron open timber store and a yard for storage. The twisted timber-frame and whitewashed building remains today and is used partly as an office (Signs of the Times) and part private residence. Trading in Tebworth in 1779 but closed by 1789. In 1693 the premises included a malt kiln. Operated at 4 Hockliffe Road, Tebworth. Premises built in 1834 and trading as a beerhouse by 1853. Closed between 1910 and 1914 and now a private house. Hi, on the 1881 census for Chalgrave a James Creamer is shown as the licensed victualler but does not give the name if the pub. He reverted to being an agricultural labourer by the next census living in Hockliffe.James born in 1819 in Milton Bryant was the father in law of the 3rd great uncle.He married Sarah King at St Nicholas’s, Hockliffe in 1840. He died in 1899. Do you know if it was the beer house he ran? I have now managed to contact Stephen Coleman, Historic Environment Information Officer at Central Bedfordshire Council, who has kindly taken the time to research this. In Harrod and Co’s Directory of Beds., Bucks. etc. 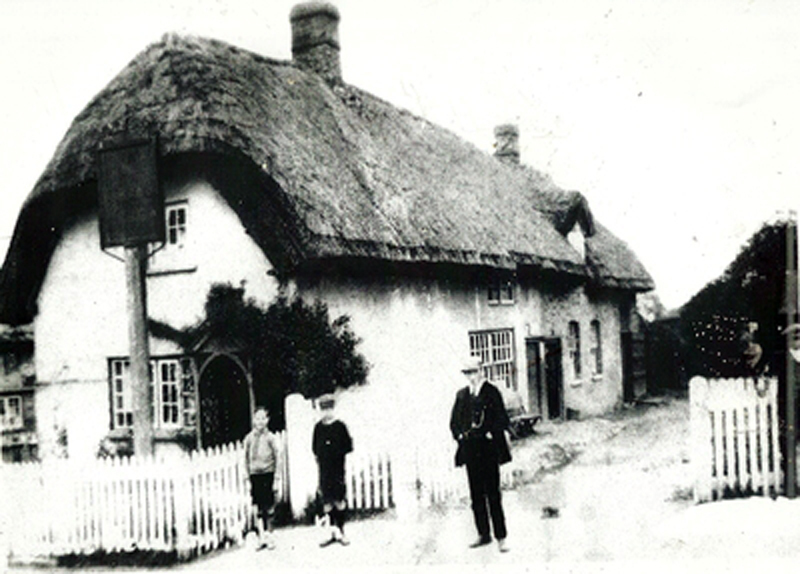 of 1876 James Creamer appears under the entry for Chalgrave (“with the hamlets of Tebworth, Hockliffe and Wingfield”) as running the Red Lion Inn in Hockliffe, i.e. that part of Hockliffe on the east side of the A5 which was part of Chalgrave parish until 1929 and hence why he appears in the Census of 1881 under Chalgrave. Alongside James a John Creamer is also listed as a Beer Retailer, presumably a separate enterprise. The entry for Chalgrave in the Returns of Licensed Premises for 1876 held at the Bedfordshire Archives and Records Service (BARS) also gives James Creamer as occupier of the Red Lion P.H. (the owner was John Batchelor of Dagnall). How long he was at the Red Lion before 1876 and after 1881 is uncertain but according to the Directories James was not there in 1862 (Charles Heckford was there then) nor in 1890 (James Robert Turner). The Red Lion has been demolished but stood where No. 11 The Blackbirds now fronts onto the A5 in Hockliffe. This road name commemorates the original name of The Red Lion – The Blackbird or The Blackbirds as it was called at the beginning of the 19th century according to documents at BARS. The name was changed to The Red Lion sometime between 1804 and 1821 and remained so thereafter and certainly up to 1967 and the mid 1970’s according to a couple of photos we hold taken then.